A snippet of Banksy. Photo by Christine Champagne. 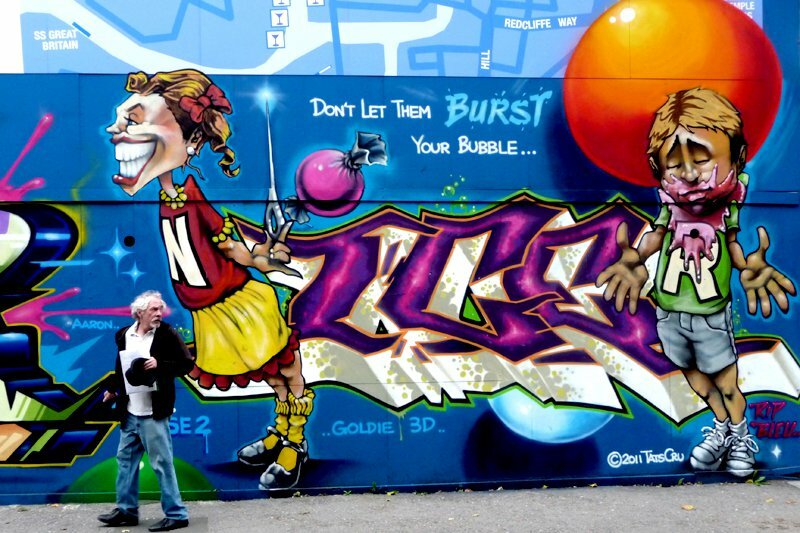 BRISTOL, England – Is there a law against taking pictures of graffiti and street art? The question crossed my mind when two police officers approached me on a street in Bristol, England, and asked me what I was photographing. "Graffiti," I said, pointing out the figure. "It's a little vampire." The tiny artwork had been painted next to a side entrance of their police station in a rather daring move on the part of the artist. I hadn't noticed exactly what the building was before I started snapping. But the police didn't seem to mind the cute little fangster. In fact, they admired him with me. "So is graffiti legal in Bristol now?" I asked. They both had a good laugh, which answered my question. "Banksy is from Bristol. His name is Robert," one of the officers said. I think he might have meant Robin. There have been reports in the British press identifying the anonymous Banksy, the world's most famous street artist, as one Robin Gunningham. But maybe this officer knew something this reporter didn't. I wasn't visiting Bristol to uncover Banksy's identity. I was there to see graffiti and street art. And there was plenty to admire in the port city of nearly half-a-million people an hour-and-a-half west of London. Banksy got his start in Bristol in the early 1990s, and now the city is internationally known for its graffiti and street art scene. I arrived a couple of weeks after , the August 2011 festival that was billed as one of the world's largest outdoor art projects. With the blessing of local authorities, artists from all over the world were invited to descend upon central Bristol's Nelson Street to paint the exteriors of ten buildings in six days. The stretch of road, which according to locals was once dark and gloomy, is now alive with art that practically jumps off the walls. It's truly something to see, whether or not you follow street art. For those who do, the now-permanent exhibit includes the work of Bristol legend (who was one of the organizers), Germany's , of France, and Poland's , to name just a few. As a New Yorker, I was particularly proud to see had left their mark. After wandering up and down Nelson Street one afternoon, marveling at the dozens of brilliant pieces, I took a random walk around Bristol and spotted Banksy's iconic sniper and child painting on Upper Maudlin Street. I had planned to look up the locations of Banksy's work and chart a tour for myself (see ), but it was a thrill to stumble upon one of his creations. I felt like I was making a great discovery. I would later see more of Banksy's art, including an eerie depiction of the grim reaper painted on the side of , a music venue and nightclub on a boat. I also saw the famed Park Street stencil of a man looking out a window, trying to spot his wife's lover, who is hanging naked just outside, clutching the windowpane with one hand. At , I saw an angel with a bucket of pink paint plopped over her head. Banksy donated the cheeky statue to the museum a few years ago. One of the museum employees, an older gentleman, told me that he was Banksy when I asked a question about the artist. He wasn't the only one who would make this claim, by the way. It's the big joke in Bristol, where apparently everyone is Banksy. "Nice to meet you in person," I replied with a wink. "I love your work." Christine is a New York City-based writer who celebrates creativity in media, advertising, business, and design. She travels for the joy of seeing new things and meeting new people and would ultimately love to see the Earth from space.